Beautifully decorated two bedroom apartment close restaurants, dining, family-friendly activities, nightlife, and public transport. 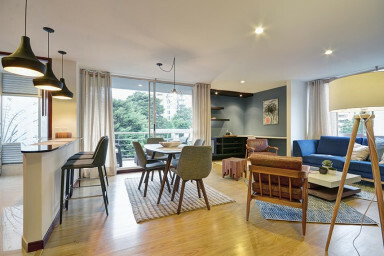 Decorated beautifully from head to toe with a gorgeous mixture of furnishings between the highly classic and gorgeously modern, this stunning apartment allows its residents to enjoy the beauties of a dream stay from both inside the apartment and outside. This lovely two-bedroom apartment offers amazing amenities such as indoor living areas fully furnished with high ceilings, recessed lighting, satellite TV and just across the counter, there is the state of the art kitchen filled to the brim with handy tools such as a blender, coffeemaker, refrigerator microwave, toaster and oven. We are available 24/7 for any inquiries or questions you might have, information of what to do and where to go in Medellin. Check in can be scheduled between 4:00pm and 8:00pm with no extra charge. After 8:00pm and anytime on Sundays and Colombian official holidays, there is a check in fee of 10USD or COP30.000 payable in cash. My place is close to restaurants and dining, family-friendly activities, nightlife, and public transport. My place is good for couples, solo adventurers, and business travellers. The apartment is within walking distance to almost everything you'll want to do while you're here and for the other locations, taxi's are easy to call and are metered so you don't have to worry about overpaying. The metro station is a 15 minute walk down the hill.